My first attempt of upgrading project to use spring 3.2.0.RELEASE. Spring 3.2 may not be compatible with old version of spring, so make sure about it. It didnt work then I found the class “TypeValue” is part of spring-expression jar file. So i added it explicitly with version 3.2 and it worked . This error occurs if there are two beans implementing the same interface and referenced. At times it is required to load properties not present in the war file. Typical usage can be have a war/jar file bundled and having property file for different environment such as dev, QA and PROD. It easy to put outside the war so that everytime build is not required. Fortunately is pretty simple in Spring 3. The value of config can be set a -Dconfig in runtime environment. Like it project is run using maven it can be set as MAVEN_OPTS parameter. This post will give brief idea about creating views, controller in Spring. Note: The code can be downloaded. URL for download is present at the end. A simple example : Store the information of a person. The property of a person is Name and City with a unique id. Note: The user is stored simply using a HashMap ( for simplicity) . Ideally all calls should go to DB. Lets create the Controller where all the actions happen. @RequestMapping(class-level): Annotation for mapping web requests onto specific handler classes and/or handler methods.All urls inside this controller should precede with the url mentioned as the value. @RequestMapping(method-level): The function will be called if the url maps the given value. Other attributes can be set as RequestType(GET or POST etc) . ModelAndView: This class merely holds both(Model and view) to make it possible for a controller to return both model and view in a single return value. The object tell which view to resolve and what model object should be passed. ModelMap: Implementation of Map(LinkedHashMap),building model data for use with UI tools.Basically replacement of setting values as request attribute. Method such as delete and displayAll returns the String. The return value is mapped to view name. The view name is resolved using InternalResourceViewResolver configured in mvc-dispatcher-servlet.xml. Note: I have defined controller to view mapping in couple of ways. There are more ways to define. This view is used to save and update the users. The web.xml is pretty basic .. Declaring the org.springframework.web.servlet.DispatcherServlet and loading the spring servlet.xml. The code can be downloaded at the end. This <context:annotation-config /> tells that spring in annotation enabled. This <context:component-scan base-package> tells where beans are configured. 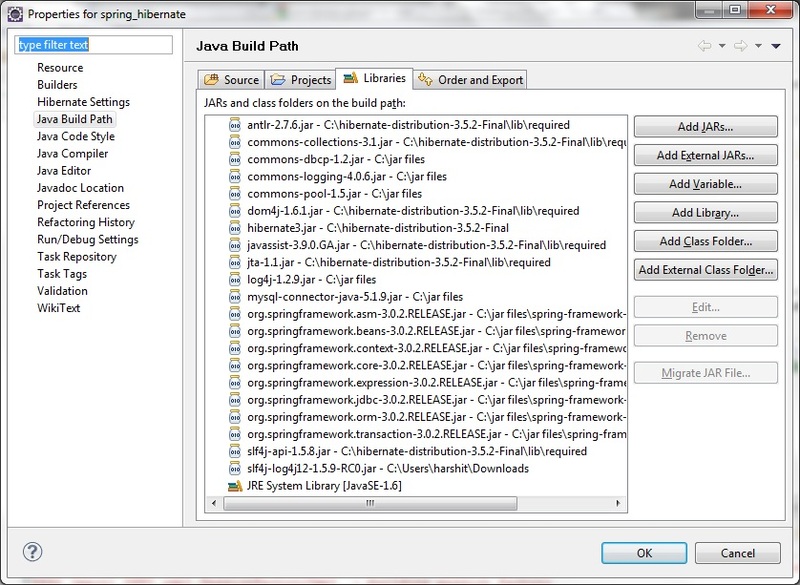 And InternalResourceViewResolver resolve view names to jsp pages present in WEB-INF/pages. Note: If you are going to make an webapp dont forget to put a valid url in the “CallBack Url” field. The valid url can be back to your localhost. But dont put “localhost” as twitter doesnt provide support. I had put http://127.0.0.1:8080/SpringMVC/callback for this application. The value of url can be changed at runtime. 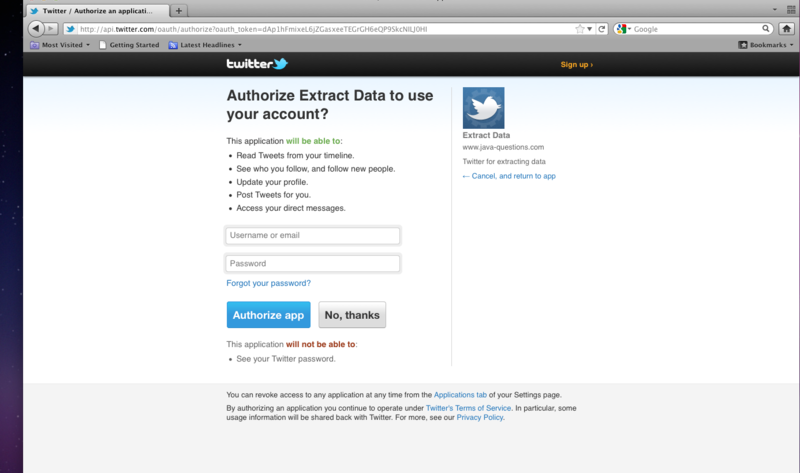 When a user clicks on the hyperlink an oauth authorize request is sent to twitter by sharing the token key and token secret and user is redirected to twitter page. 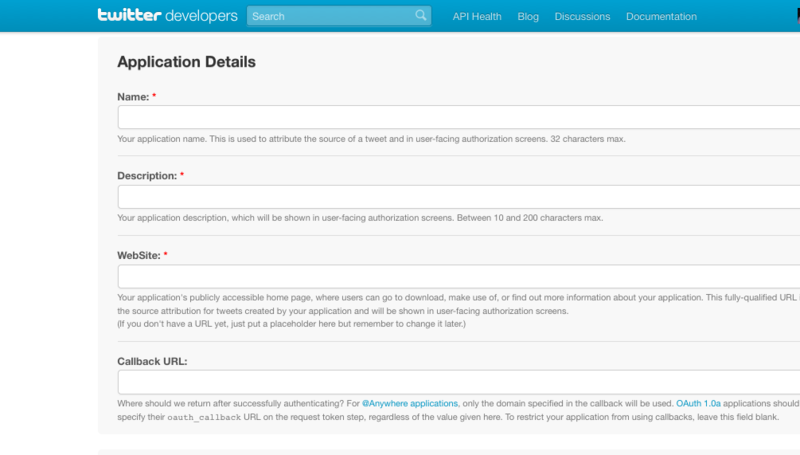 After login into Twitter the user will be redirected to the callback url and the username will be displayed. I am using Twitter4j for connecting with Twitter. The callback url can be set as shown above. The MyAcessToken is used to persist the token for the request. 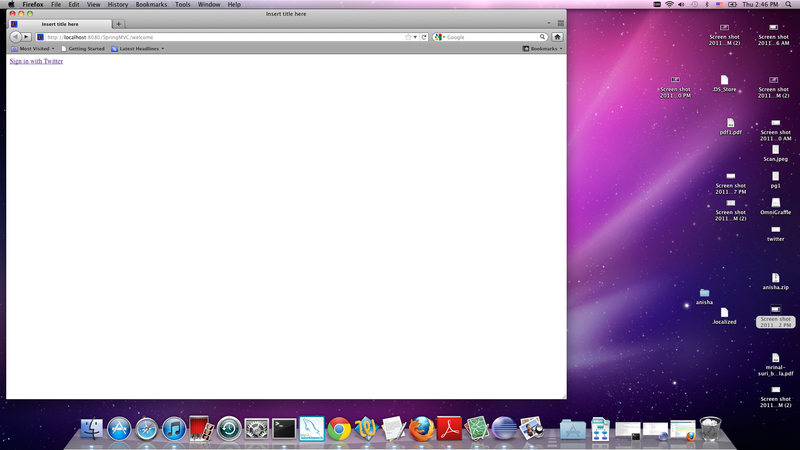 So when the user enters http://127.0.0.1/SpringMVC/welcome , they will be redirected to login.jsp. Once the user comes back it will be redirected to “hello.jsp” with user name displayed.Note the MyAccessToken set for user before request is made is used here. At times it is required to add Enum values on the jsp page so that its easy to handle on the server side. To display this feature i am using spring 3.0 version. I just want 4 working days in a week 🙂 . Now register a binder to the controller. Set the WorkingDay object to the model object for the view. It should be in the same controller in which the above binder is registered. The value of path should match the field name of the property of the command object passed. The jsp page will contain four radio buttons. How to configure Hibernate in Spring. The objective of the tutorial is to understand how the DB can be configured in Spring using Hibernate. Following is the list of jars I used. 2)	Create a table User and add some columns to it. 3)	Insert some records into the table using mysql.. The bean “datasource” is used to configure the properties of the DB. The bean “mySessionFactory” is used to maintain the session of hibernate. This is taken care by the spring container now. The property “mappingResources” takes the list of hbm files which will be mapped to this session. Also the datasource property is set in this bean. The bean hibernateTemplate is the one used to interact with the DB. The Spring application context will manage its lifecycle, initializing and shutting down the factory as part of the application. LocalSessionFactoryBean is the preferred way of obtaining a reference to a specific Hibernate SessionFactory, at least in a non-EJB environment. The bean “hibernateDao” is the java class and the hibernateTemplate property is set.